Capital Accommodation Wellington - is a unique complex. Offering 87 comfortable 25 square metered studio units. Ideal for those that want live in comfort without having to pay too much. 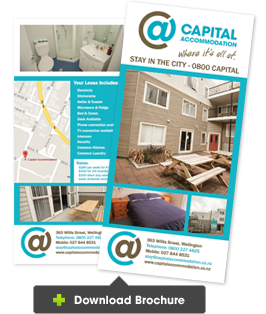 We offer a selection of furnished modern studio apartments. 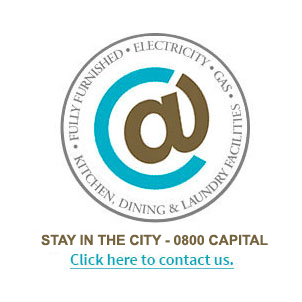 Each apartment has its own kitchenette and ensuite bathroom and available for long term leases. The property comprises of three separate three storey buildings, all with landscaped gardens. Each building has three large common areas with a full kitchen including ovens. Also each level has its own common laundry with a washing machine and dryer. Check out our photo gallery of all accommodation on offer from Prime Hotels.View Prime Hotels Gallery.